Of all of the modern sources of light none are as controversial as fluorescent lighting. It has become ubiquitous in many building types including office spaces, retail spaces, and factories, yet it inspires intense hatred. Concerns range from a dislike for its color temperature and color rendering capabilities, disposal issues, to more serious (but unfounded) health concerns. These concerns have recently intensified because of the federal government’s gradual banning of certain types of incandescent lamps thereby limiting consumer choice. Even with the rapid development of LED technology fluorescent lighting is likely to remain popular for at least the near future. 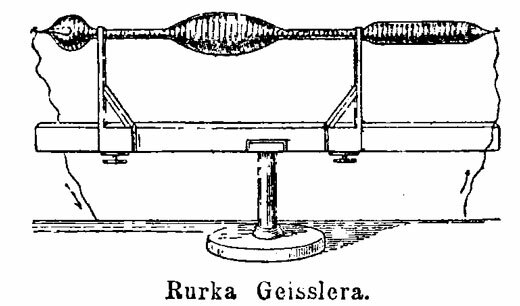 In 1856 a German glassblower named Heinrich Geissler created a sealed, evacuated glass tube with a metal electrode at each end. He then filled the tube with gases such as neon and argon. When an electrical current was passed through the tube to the other electrode the gas would emit light. 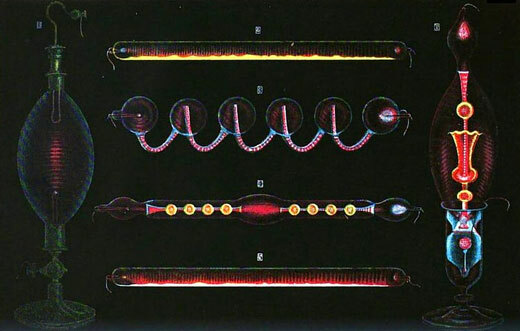 Known as a Geissler tube it was not really seen as a possible light source, but rather only as a parlor trick. But nevertheless, it was a significant development and ultimately led to the development of fluorescent lighting. The next major development was made by the French scientist A.E. Becquerel who experimented with phosphorescence and applied various luminescent materials as coatings to the inside of Geissler tubes. Fluorescence successfully occurred but unfortunately they were inefficient and had a short operating life. Inspired by the Geissler tube the Frenchman Georges Claude successfully patented his electrode for neon tubing (1915) and then went on to build a world-wide neon signage empire that lasted through the 1930’s. A parallel development was made by the American electrical engineer and inventor Peter Cooper Hewitt. 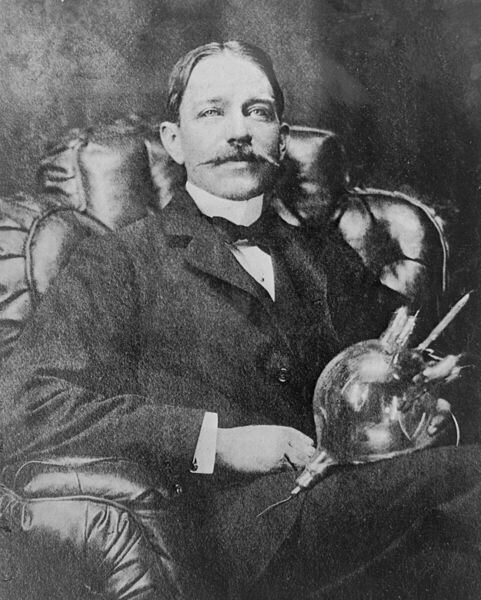 He developed a lamp that was the precursor to the modern fluorescent lamp. He coated the inside of a glass tube with a luminescent compound and filled the tube with mercury vapor. An electrical current was then passed between the electrodes producing a bluish-green light. It was much more energy efficient than incandescent lighting but because of its color it found limited use. The modern fluorescent lamp was developed between 1934 and 1938 at the General Electric laboratories in New York. The glass tube was filled with mercury vapor and argon and coated with phosphors on the inside. As a current passes through the mercury vapor the electrons from the electric current collide with the mercury gas and ultra-violet light is produced. The ultra-violet light then reacts with the fluorescent coating and causes it to glow brightly. Different phosphor coatings produce different shades of white. 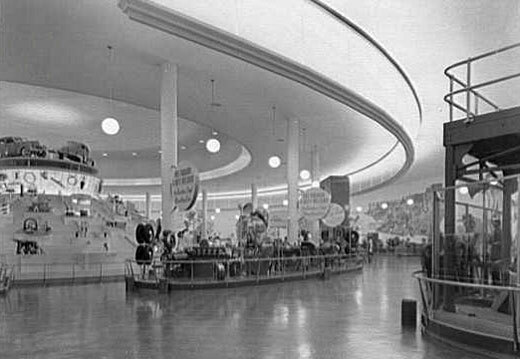 General Electric introduced fluorescent lighting to the public at the 1939 New York World’s Fair. The quality of the phosphors was still rather primitive so the color was rather poor. Still, fluorescent light offered an economical and efficient alternative to incandescent lighting and became the standard light source for office interiors, factories, and retail stores. Research has continued for the past seventy years concentrating on the improvement of the phosphors. The current generation of rare earth tri-phosphors produces an outstanding quality of light. Unlike incandescent light sources fluorescent lighting is not considered a point source. Since its light output per unit area is much smaller it needs a substantial amount of surface area to generate its light. Historically this meant 4 foot and 8 foot long lamps that were excellent at creating an even distribution of high levels of ambient light. This type of lighting was desirable for building types such as office interiors, large retail spaces (big box stores), and factory interiors. It wouldn’t be until the late 1980’s that compact fluorescent lamps were developed and could be used as point sources.